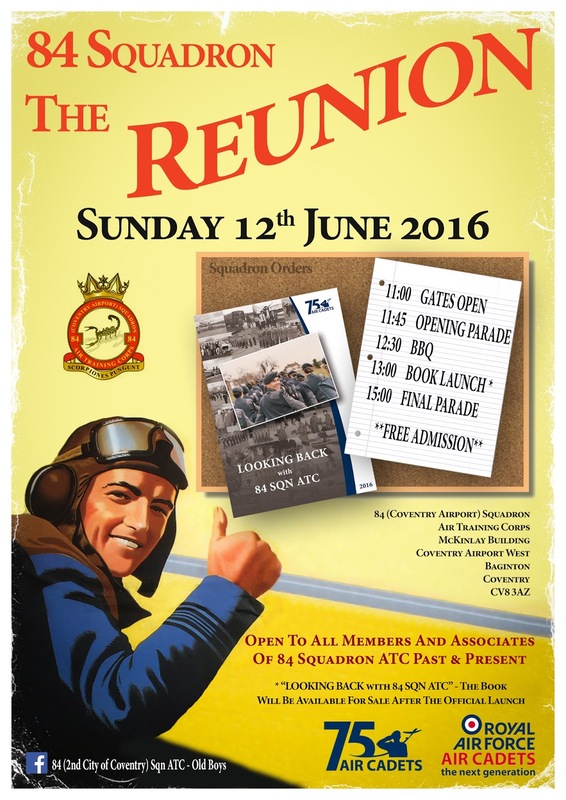 On Sunday 12th June, 84 (Coventry Airport) Squadron are hosting a Reunion event to celebrate the 75th Anniversary of the Corps as well as the 70th year of the Squadron in its present format. 84 Squadron was formed following an amalgamation and reformation of the Coventry Squadrons back in 1946. Since then its survived the test of time including a move fro Cows Lane in Coventry to its present location at the Airport. Many faces have come and gone both as staff and cadets, some have even come back as Civilian Committee and are still in contact today. The Reunion event is an open invitation to any past and present Squadron members to to celebrate and reunite together. The history of the unit has been put together into a book detailing year-by-year the progression of the cadets, the staff teams and includes those all important camp photographs! See details on the flyer below for times. If you are intending to attend, please RSVP by emailing reunion@84sqnatc.co.uk with numbers and any special dietary requirements. Sewing Skills Stand Out Supreme!